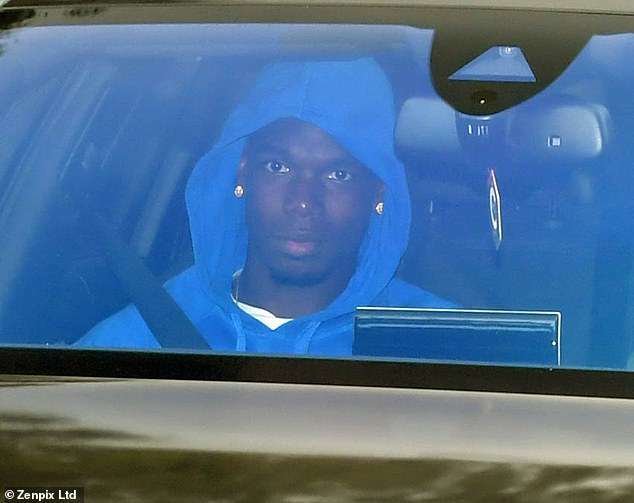 Jose Mourinho and Paul Pogba have been pictured arriving for Manchester United training on Thursday as they bid to win the power struggle currently engulfing the club. 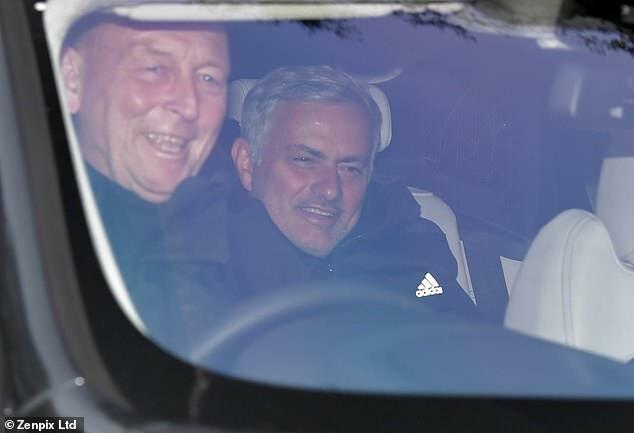 A smiling and laughing Mourinho was driven into United’s HQ at Carrington in a black Jaguar XF and the Portuguese manager had his adidas jacket zipped up on a crisp autumn morning. Pogba too was keeping warm when he arrived shortly after, although he didn’t appear quite as cheery as his boss. 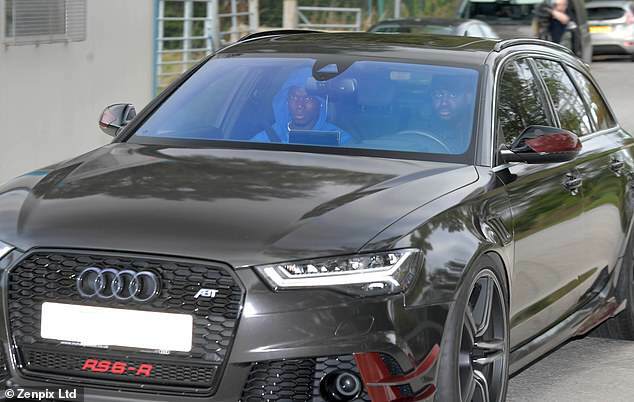 The French midfielder had on a blue hoodie but the emoji earrings were still on show as he made his way to work in the passenger seat of a black Audi. Their arrivals come almost 24 hours after footage emerged of a tense training-ground exchange between the duo at United’s headquarters on Wednesday. The two became embroiled in a spat at Carrington after Mourinho criticised Pogba for posting an Instagram video of himself laughing while he watched United’s shock Carabao Cup loss to Derby County. Pogba could be seen joking with Andreas Pereira and Luke Shaw in a private box at Old Trafford in the short clip. ‘Why are you smiling?’ Pogba asks Shaw. Mourinho thought it was disrespectful to their team-mates who fought back with 10 men to draw 2-2 in injury time before going out of the competition at the first hurdle on penalties. When Pogba arrived for training on Wednesday and shook hands with first-team coach Michael Carrick and media relations office John Allen, he was visibly shocked by a comment from the smirking Mourinho. An irritated Pogba then followed Mourinho and had his say before walking off. When Allen came over to join the increasingly fractious conversation, Pogba protested and pointed at Pereira and Shaw as if to ask why they, too, were not being reproached. They suspect the manager was making a power play to put Pogba in his place and show him who is in charge, just as he had done 24 hours earlier by belittling him in front of his team-mates. Pogba had also raised eyebrows by venturing into the dressing-room area on several occasions on Tuesday night wearing a bright white tracksuit and gold-rimmed glasses when other non-playing members of the squad were dressed more conservatively, in accordance with the club’s policy. Mourinho, who was unhappy with the effort of his players against Wolves, warned them in two meetings on Tuesday not to fail him again – yet still saw them beaten by Championship side Derby. Afterwards, he held an inquest with his coaching staff until 12.30am to pore over the game – longer than anyone can remember him keeping them back since taking over in the summer of 2016. Next up for the Red Devils is a trip to West Ham on Saturday lunchtime. The Hammers have found form in recent weeks, beating Everton and Macclesfield and drawing with Chelsea. Other players were also seen arriving at the training base with midfield duo Marouane Fellaini and Fred spotted pulling in.